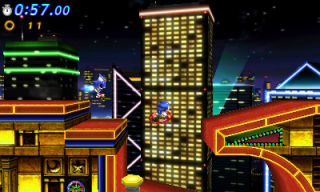 The first rival faced in the 3DS version of Sonic Generations is Metal Sonic, who challenges Classic Sonic to a race in Casino Night. Instead of simply beating his robotic rival into submission like in the console version, Classic Sonic needs to beat his metal double to the signpost at the end of the act to win the battle. In this manner, the fight is much more similar to their original fight, minus the fact they aren't in Stardust Speedway, and that you have to do actual platforming to finish the level. In a manner resembling the Sonic Rivals series, you can attack Metal all the way to the end, allowing for a constant fight to the end to reach the goal first. Metal will also use his drill attack to try to barge through if you get too far ahead. This page was last edited on 8 April 2018, at 09:39.